Chinese mantou (馒头) is one of the best things I love—they are basically yeast-based steamed buns steamed to perfection. Hot-off-the-steamer, Chinese mantou is soft, fluffy, pillowy, and sinking your teeth into it is absolutely amazing and delightful. Sweet potato mantou (番薯包) is one of my favorite bao (包) or Chinese steamed buns. Whenever I go back to Malaysia, I would always buy these warm, fluffy, sweet, and soft mantou from the various steamed bun vendors dotting the kopitiam (local coffee shops), markets, roadsides, gas stations, night markets, etc. They are absolutely delightful. My son loves it as a snack, too. Unfortunately, in the US, the only similar steamed buns that I can find here are the frozen and plain mantou in the Chinese grocery stores. There are no sweet potato mantous. I always miss them. A couple of weeks ago, my friend posted her homemade sweet potato mantou recipe on her Facebook. I asked for the recipe immediately. She found the recipe online here and had success making them at home.I was so excited. Finally I can make some homemade mantou that I have been craving for, with the Hong Kong flour or bao flour that I have brought back from Malaysia. I spent some serious time in the kitchen, plus a huge dose of patience. It was a success. Though the looks department could be improved significantly (which I am sure practice makes perfect), my sweet potato mantou were pretty good…soft, warm, and tasty. I love them, and I am sure my son will enjoy them as a snack before bedtime tonight! How to Make Chinese Mantou - soft, pillowy and fluffy steamed buns are THE BEST! Make these sweet potato mantou with step-by-steps. Add the sweet potato puree and all the ingredients in B and also the yeast mixture and mix using a stand mixer on low speed, for 20 minutes. You can also knead with hand for the same time or until the dough doesn't stick to your hand. Transfer the dough out of the stand mixer and lest rest/proof for 45 minutes, covering it with a damp cloth. Dust the surface with some flour and divide the dough into 3 equal portions. Make each portion into a log. 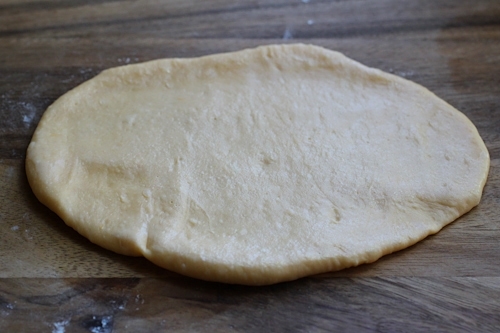 Use a rolling pin to flatten the dough to a somewhat rectangle shape. 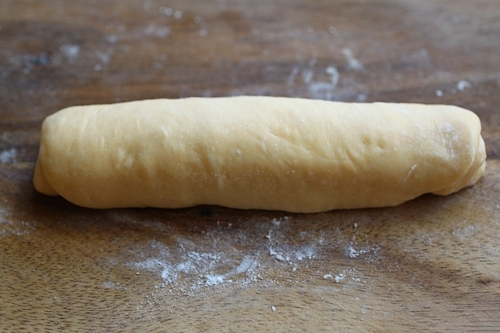 Wet the surface of the dough with just a wee bit of water, using a pastry brush or your hand. 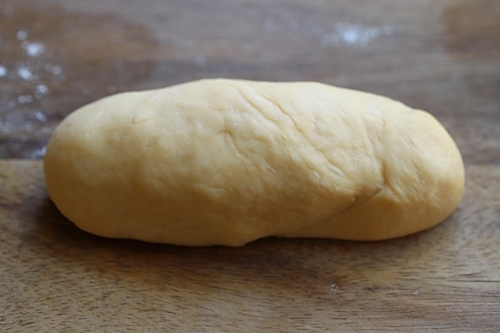 Roll the dough up tightly(this is important so the mantou remain a nice shape after steaming), into a log. 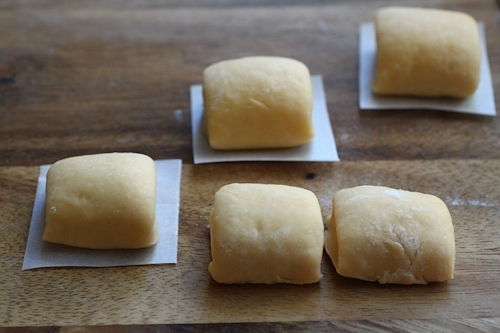 Cut the dough into 4 or 5 equal pieces, in mantou shape and place them on 2-inch by 2-inch baking or steaming paper sheets. Repeat the same for the remaining two portions. You will make a total of 12-15 small mantou. 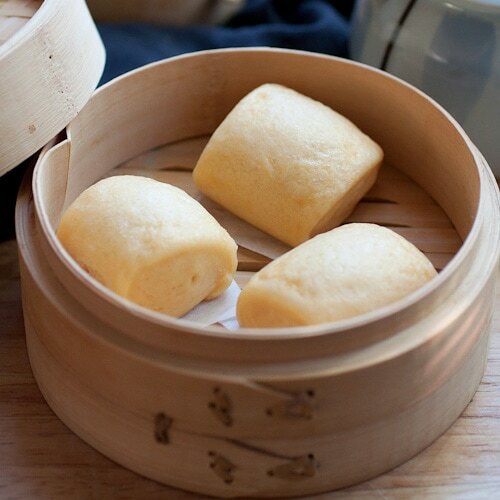 Bring your steamer to a boil and steam the mantou in batches, for 12-15 minutes. I used bao flour or Hong Kong flour specifically for Chinese steamed buns. If you are in Malaysia or Singapore, you can get the bao flour easily from baking supply shops or supermarkets. For best results and accuracy of the recipe, please use the metric measurement. All purpose flour and cake flour should work just fine, or you can try this Vietnamese steamed bun flour found in Asian supermarkets in the US. I haven't tried this recipe using all purpose flour, cake flour or the Vietnamese steamed bun flour so I don't know the end results. Make sure you have new yeast, as old yeast will not rise/proof properly. Use warm water to activate the yeast. It's important. The texture of the mantou is a little dense, not the super soft and fluffy type but my friend in Malaysia tried the exact recipe and had very soft and fluffy mantou, perhaps due to climate difference. 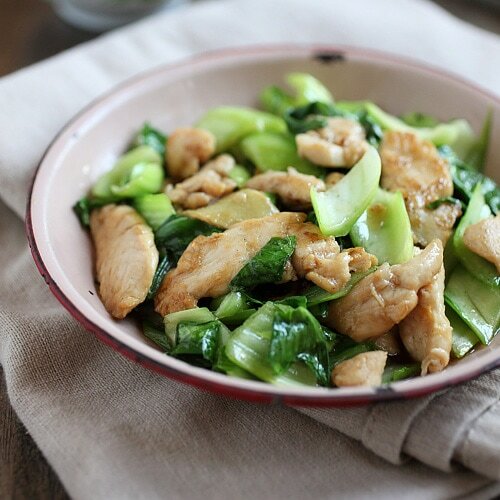 My friend sent me this recipe, which is in Chinese, which she got it from here. I basically cut the quantity of the following recipe into half. All photos and recipes on Rasa Malaysia are copyright protected. Please do not use the photos and recipes without prior written permission. If you wish to republish this recipe, please rewrite the recipe in your own words instead of copy and paste and link back to //rasamalaysia.com/sweet-potato-mantou-steam-buns/. Thank you very much! Hi Reina, don’t quote me because I am not a flour expert but I think Hong Kong flour is bleached, low-gluten and specifically for steamed buns or baos. You can try using all-purpose flour for this recipe. I just thought I’d mention that many recipes for Bao in the US call for “cake flour” instead of all-purpose. I hope that helps. Hi Goldfish, that’s true. You can use cake flour for bao. hello, did you use dry yeast or fresh one? You can make a steamer substitute if you have a wok with a cover. A Dutch oven or wide and deep skillet would do. You put something in the bottom to elevate a plate that fits the pan (leave room around the edges), add water — enough to make the steam, below the level of the plate. Put the buns on the plate in the pan, and steam with the cover on. As someone who does now own a steamer of any sort, I have no idea how to make this recipe with what I have on hand. I tried making some Chinese steamed bread once before and couldn’t seem to get a set up that would steam well enough to cook the bread. Any ideas? You need enough water at boiling point to create the continuous steam to “cook” the buns. Steam longer if they are not entirely cooked. Also don’t overcrowd the steamer but steam in batches. ls the hong kong flour is the OO flour? why is it the steam bun in chinese bakery or in the restaurant are so fluffy and soft what’s the secret? l did try to make but is not fluffy. I haven’t heard of OO flour. Where are you based at? I think 00 flour refers to superfine flour. Which I don’t think is the right flour for this? Bao or bread flour is better suited, right? Anyway, Bee, these look positively fluffy and appetizing. Perfect with a slather of kaya. You can try cake flour. Great recipe, I adapted into pumpkin steam bun and they are soft and fluffy. Love it! Thanks! Hi Bee, I love the sound of this recipe. Sweet potatoes are my favourite, but I’ve never tried sweet potato mantou. I have the same problem here in the UK – only plain frozen ones are available in the supermarkets. I do however, prefer fried mantou… If I were to fry these ones, do you know if I would have to steam them first still? Yes, you can steam and then deep-fried, but I think this one is best steaming. Regular plain mantou is great when fried. Hello, I tried your recipe but obviously I made something wrong. Nothing happened during the 45 minutes, it didn’t raised at all. But the yeast was working as the first 20 minutes were fine. I wonder if maybe my dough was too dry, how is it suppose to look like before the 45 minutes ? Yeah, I use warm water the second time and it worked out fine. I made these the other day and they are super duper yummy!! Everyone I shared them with loved them and asked me for the recipe, so I sent them the link to this page. Thank you for sharing yor recipe. Hi, how will the recipe change if I use instant yeast? I haven’t tried I am not sure, but should be OK.
Lovely recipe but what do you served it with? I haven’t tried any of the plain steam buns, sweet Potato is one of my favourite. You just eat them plain…that’s how we eat them, as a snack. Can I use this dough recipe to make Bao? I wanna put in char siew fillings. These were so nice- they were a little bit sweet, soft and so fluffy. I used half the flour because I wanted to retain the flavour of the sweet potato, and it worked really well, thanks a lot! I’ve tried this recipe today. 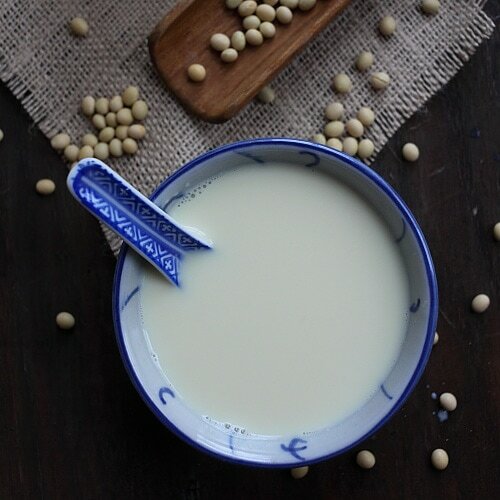 I’ve been looking for mantao recipe quite some time (tried several batches last week, and didn’t satisfied with the result). This recipe worked so well. Thank you. The bun come out so soft, even when it’s cool. I can tell my kid enjoyed them too, he ate 3pieces right after i finished steaming the bun (i made them small). ^^ thanks a lot. Btw, do you have any idea how to remove the smell of the yeast ? … but u cud try and half a batch do 1 each way and see if the difference in fluffiness is worth the extra waiting? I would love to make these for my toddler. I am wondering if I can substitute this with organic unbleached all purpose floor? You reckon? Thank you! I think so. You can try! I don’t have a steamer and its for a school project it can’t have wheat? What should i do? My son LOVES mantou and we have not found any like this since moving to Austin — I am going to surprise him with these! Thank you!! Awesome. I am sure he will love it.